February how can that be? I have been busy making all kinds of new things. 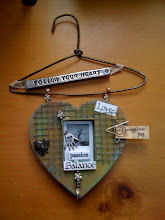 I signed up for two trades for Artfest, ATC trades and Fatbook trades. I have been working on these two projects forever (well it seems like it...) I made 32 Artist Trading Cards and 52 Fatbook pages.....I learned something about myself during these projects, I don't like to do repetitive work! It was gruelling, but I'm really proud of how they turned out and I got them out in the mail this week. I can't show you now, I want them to be a surprise. I will post them in April. 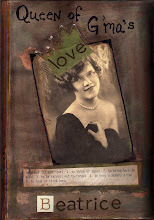 Next I'm going to work on an Inspiration Deck that my Artfest housemates and I are creating. I am crazy about Shrines. This is one I recently made for myself, honoring the love of my life, Sam! This is unusual for me, as I usually make things for others and give them away. This is definitely my new favorite project! They are really fun and your imagination is the limit! So far two of my friends and my mom have come by and made them for their loved ones for Valentines day and another friend is coming by Monday. It is great to have people in my art studio! 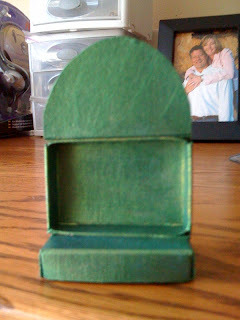 Take the matchbook apart and use a drawer upside down for the base, set another drawer on its side, as shown, and cut the cover of the matchbox at a crease, then cut one of the larger panels into a shape to form the top of your shrine. The one above is pointed, this sample to the left is rounded, use one of these ideas or use any shape you like, the sky's the limit. 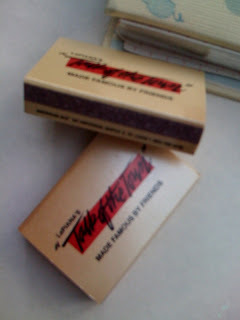 Glue all the components together with Liquitex Matte Gel, you may need to re-apply glue to corners, sometimes they lift. 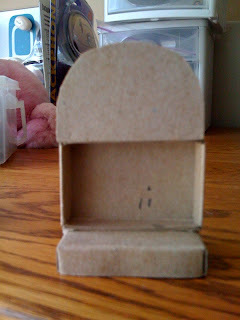 When dry, apply a coat of gesso over the entire shrine to cover up the writing on the matchbox. When dry, apply a coat of paint, I love a paint I just discovered called Lumiere by Jacquard, I used #556 Halo Blue-Gold (looks green to me?). Gather little things (as you don't have a lot of room), beads, charms, pictures (printed on thumbnail size), rhinestones, wire, etc. and start gluing, I used the matte gel again, it holds things great even the heavy heart in the corner. I hope you enjoy making your shrines as much as I do! Enjoy every magical moment in your life... I hope there are lots! Welcome to blogland. Thank you for answering my question about ArtFest swaps. Your blog is beautiful, especially your header. Hi Jacque! I saw your post on the Artfest list and then noticed a reference to matchbox shrines. 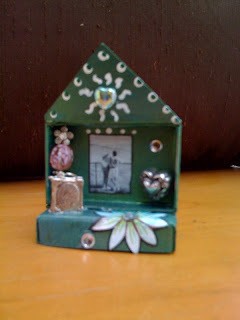 I've made lots of little matchbox shrines, I even teach a workshop to guide others through the process - yours are great, especially how you've cut and modified them. Thanks for sharing this post! saw your blog name on artfest yahoo. i'm from Santa Maria and will be coming to artfest 2009. there are several of us coming from SB Co. this will be just my second time and the others are old pros. i will keep an eye out for you. I call Santa Barbara home. I share my life with my family Sam,Spencer, Sydney. I believe it is essential for everyone to find their soul and inner spirit. I have found the best way to do this is through my art and creativity! beach walker, friend to many, traveler, journaler, book maker, mixed media creator, painter, a mother, a wife, a daughter, a teacher, always interested in learning new things, and anything to do with art.... i'm jacque book. Oh and I love to dance. too. The Four Agreements, The Secret Lives of Bees, Anything that is Motivational. Jack Johnson, Eric Hutchenson, James Taylor, Jason Mraz, John Mayer, Colbie Caillat, So many more!